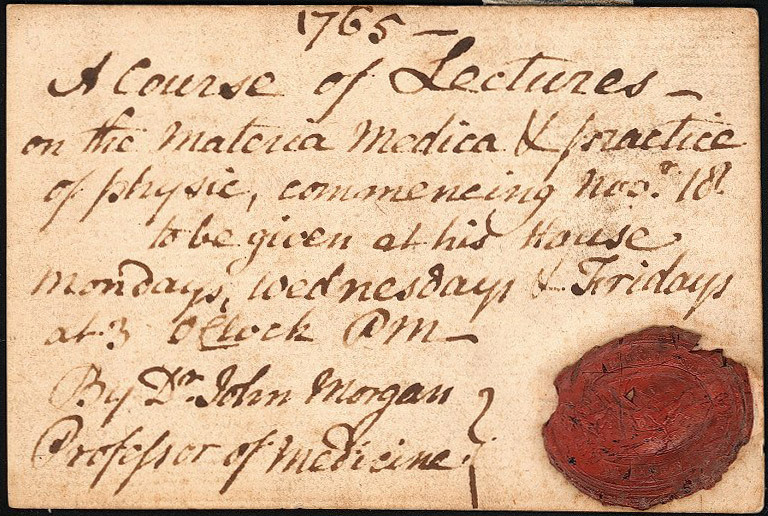 John Morgan, M.D., the son of Evan Morgan, a Welshman, and Joanna Biles, was born in Philadelphia in 1735. He received a classical education at Nottingham Academy in Chester County, Pennsylvania, before entering the College of Philadelphia (now the University of Pennsylvania) on May 25, 1754. He was part of the College’s first graduating class, receiving an A.B. on May 17, 1757. During his undergraduate years of 1755 and 1756, he began to study medicine under Dr. John Redman of Philadelphia, also working at the Pennsylvania Hospital as Resident Apothecary. After leaving the College, Morgan first devoted himself to the military for four years, holding a commission as lieutenant and acting as a surgeon on the western frontier in the war between Great Britain and France. After the end of the war, he sailed for Europe in 1760. Here, as he studied medicine in Edinburgh, Morgan impressed the medical community with his intelligence and charm before earning his M.D. in 1763. He spent the following winter in Paris, observing French medical practices as well as presenting medical demonstrations to the medical community. In the spring of 1764, in the company of the Duke of York, he traveled to Italy where they had a private audience with Pope Clement and had their portraits painted by Angelica Kauffmann. During this unusually grand tour of Europe, Morgan was elected a member of the Royal Academy of Surgery at Paris in 1764 and of the Royal College of Physicians of Edinburgh and of London in 1765. For Morgan, 1765 was a year of major events. On his return to Philadelphia, he married Mary, daughter of Thomas Hopkinson and sister of his college classmate Francis Hopkinson. 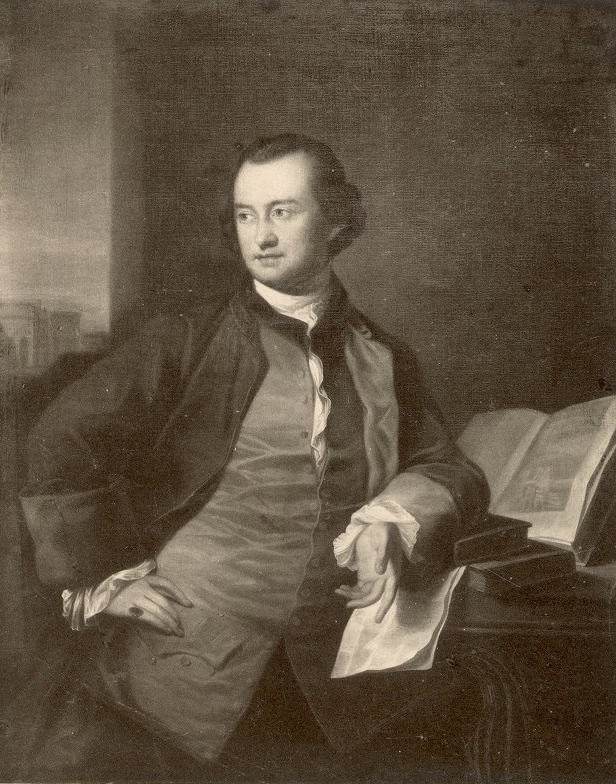 1765 was also the year Morgan and William Shippen, Jr., pioneered systematic medical teaching in America by founding the first medical school in the American colonies. Shippen was another Philadelphian who had traveled to Edinburgh for his medical education, earning his M.D. in 1762; he had been offering a course of private lectures on anatomy and obstetrics in Philadelphia since his return home. Morgan now proposed to the trustees of the College of Philadelphia (now the University of Pennsylvania) that they establish a medical school with him as the professor. On May 3, 1765, he was elected by the trustees of the College to the chair of theory and practice of physic, the first medical professorship in the country. Morgan immediately set forth his plans for the school, and only then recommended that Shippen be named professor of anatomy. Shippen accepted the position, but for many years resented the fact that Morgan had put himself in charge. During the American Revolution, the Congress named Morgan in 1775 as director-general of the army’s hospital, then located in Boston. The task was enormous; establishing and organizing a medical service was hampered by logistics, a shortage of supplies, an outbreak of smallpox, and a lack of understanding of health issues by the Congress, military authorities, and rank and file soldiers. Every problem was blamed on the director-general, and Morgan’s old rival Shippen was quick to take advantage of the situation to unseat Morgan. First Shippen took over medical operations east of the Hudson, and then in 1777 he replaced Morgan entirely. Two years later Morgan succeeded in obtaining vindication from Congress; after formally charging Shippen with fraud and speculation in hospital supplies, Shippen was court-martialed and resigned in 1781. Morgan by this time was in poor health and exhausted by the long feud with Shippen. He had not taught classes since 1775. Morgan died in Philadelphia on October 15, 1789, at age 53. Morgan was active in many Philadelphia institutions and organizations. He was a founding member of the American Philosophical Society in 1766, a member of the medical staff of the Pennsylvania Hospital from 1773 to 1783, one of the original fellows of the Philadelphia College of Physicians, and also a member of the Philadelphia Society for Promoting the Culture of Silk. Although born to a Quaker mother and Baptist father, he became a vestryman and warden of the Anglican Christ Church. Morgan was also well-known for his significant collections of European art and of paleontological specimens, collected by his brother George in Ohio.